Xobni is a great tool for heavy email users, and even becomes more powerful if you use Xobni’s LinkedIn integration. LinkedIn For Dummies is a how-to book on how to get the most out of LinkedIn. Xobni is definitely a great way to get the most out of LinkedIn. Joel includes download instructions, features, and a lot more about Xobni in his book. Upstarts! : How GenY Entrepreneuers are Rocking the World of Business by Donna Fenn. In her book Donna talks about the features of Xobni’s Outlook product, but also tells the business story of how Xobni was founded, funded, and how it flourished. Human Computer Interaction: New trends by Julie A. Jacko. There are several academic books that reference Xobni and the new paradigms we introduced to email. It is quite an honor to be mentioned in academic work. We talk about many of Xobni’s features here on our blog, but we don’t often talk about the analytics engine that sits beneath the software. Tim has latched on to one way he suggests that his readers can use Xobni’s analytics features to work smarter, not harder. We thought being in this many books was pretty cool, so we wanted to share. We’re honored. We’re proud to announce that Xobni 1.9.0 (build 9662) is now available. This version is strongly recommended for anyone using Outlook 2010 beta (32-bit), and anyone interested in putting the latest and greatest Xobni improvements to work! Download it now, or read more about the latest changes. The Xobni sidebar displays more reliably and consistently for various view configurations of Outlook 2010 beta (32-bit). Of course, we will fully support all versions of Outlook 2010 when Microsoft releases them for sale to the public. 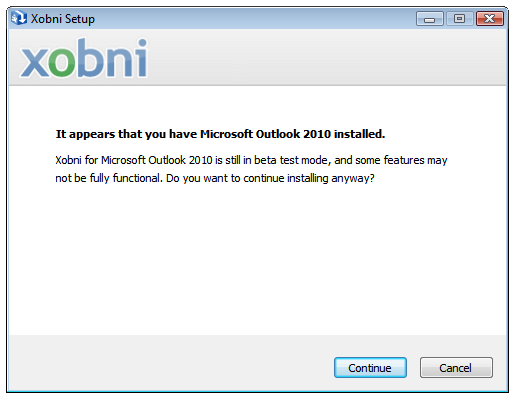 Note: If you have a 64-bit operating system, and would like to test Outlook 2010 beta + Xobni today, simply install the popular 32-bit version of Outlook 2010 beta and then install Xobni. If you install Xobni for the first time, you’ll see a new video display inside the sidebar (no more video pop-up). We’re really proud of it! See it in full size here. If you’d like to share fun facts with your contacts, we now open a message for you to customize instead of sending the email right away. Users will also randomly receive the chance to win Xobni Plus when they invite others. If signed in to the Twitter Extension, more data is shown about each Twitter name to help you choose the right one for your Xobni contacts — just hover over each name to see more information (you only need to do this once per contact). This may be a big time savings for many of our users: Now you can right-click on an email anywhere in Xobni to open that message in a new Outlook window (instead of clicking through to see it in detail in Xobni first). The “Copy Email” command now copies the date of the email and everyone in the to: line. Whew! Please continue to let us know how we can keep improving your productivity through the Xobni Community, and thank you to everyone who participated in the topics that helped inform today’s update. Tweet about your love for Xobni and enter to be one of the 14 winners to receive two Xobni Plus licenses – one for you and one for your Valentine (or anyone you think would love Xobni as much as you do). To enter, simply go to this page and click the “post to twitter” button. Winners will be randomly selected this week, finishing up on the big day of love. Hey there friends and fans of BlackBerry! We just wanted to give you a quick update on where we are with the Xobni for Blackberry product as well as some exciting news. We really appreciate the excitement and anticipation for the product and can’t wait to share it with you! So what’s the good news? The good news is that we’re in alpha and really close to having a truly compelling Xobni for BlackBerry product. We need your help! We’ve got the product built and we’re all using it internally (and loving it). To help move this process along, we’re looking for some of our most passionate Xobni friends to dive in and take it for a spin. If you’re up for the alpha, please send us an email. Don’t forget to put BlackBerry alpha in the subject field and then tell us what model BlackBerry you have and whether or not you use Xobni for Outlook. While we may not be able to include everyone in the alpha, we’ll sure try. Disclaimer: IT IS an alpha. We’ve done a pretty good job buttoning up our product but we certainly expect some bumps in the road as we scale, so make sure you can tolerate some (hopefully small) hiccups if you want to participate. Thanks in advance for your help! We’re committed to reinventing the address book for smartphones and are one step closer today.